She probably meant well. She probably genuinely thought she was sharing important insights that would serve France well in the days, weeks, and months to come. 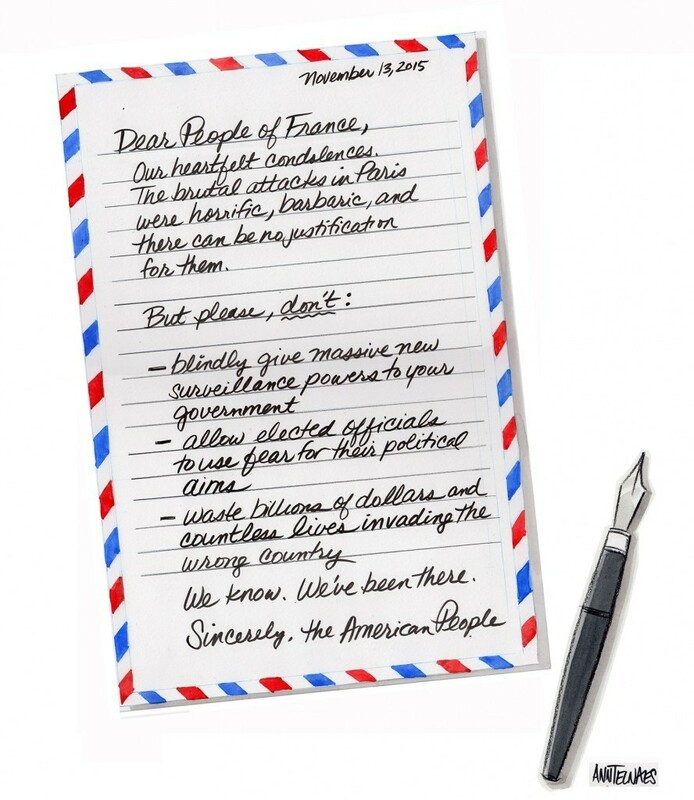 She probably thought the French—or at least the more politically astute, as she probably likes to think of herself—would appreciate the gesture. She was wrong, and she owes France an apology. Since September 11, 2001, the United States have completely monopolized the discourse on terrorism, even to the point of replacing the correct term with an abbreviated one, because it has too many syllables for the semi-literate ape who occupied the Oval Office at the time. They have shaped, or should I say twisted, the narrative to fit their ignorant, arrogant, self-centered, navel-gazing world view, and then exported it to the rest of the world, a large portion of which (including the Norwegian public) has swallowed it whole. In this narrative, terrorism is an exclusively Muslim phenomenon which was invented by Osama bin Laden in 2001; no one but the United States truly knows what it’s like; no one but the United States is truly qualified to fight back; and anyone who criticizes their methods or refuses to participate in illegal wars which fail to achieve anything whatsoever is either a coward or a terrorist sympathizer. This is not the first time I have had this kind of conversation. A common reaction is “well, OK, but September 11 was unprecedented”. No, it wasn’t. In 1993, al Qaeda detonated a car bomb in the parking garage under the World Trade Center hoping to bring down both towers, but they had parked it in the wrong place. In 1994, an Algerian militant group hijacked Air France flight 8969 in Algiers with the goal of crashing it into the Eiffel Tower, but they had no flight training and were bamboozled by the crew. Some have described Friday’s attacks as the “worst act of violence towards France since the World War II”. Let me tell you what anyone who has opened a history book or spent five minutes on Wikipedia should know: since World War II, France has gone through two foreign wars, a civil war, various military or “peace-keeping” interventions in the Middle East and former colonies, and several decades as a battlefield for the PLO, the PFLP, Mossad, miscellaneous pro- and anticommunist or -anarchist groups, and Basque and Corsican separatists. France knows terrorism. France knows how to defend itself. When the Norwegian press reports, breathlessly, that French authorities have sent 1,500 soldiers to Paris, I think to myself: that’s a relatively small number next to the thousands of soldiers and heavily armed police who are already permanently stationed in and around Paris. I’ve lived in Paris both before and after 2001, and the only significant change I’ve noticed is that some trash cans are welded shut and all public buildings have signs indicating the current threat level (on a scale of “red”, “crimson”, and “emergency”). France also knows that the only way to be one hundred percent safe is to become a police state, but the French have never had much respect for authority and have extensive experience in shaking it off, or at least shaking it up, when it displeases them (cf. 1789, 1830, 1848, 1871, 1934, 1968). So please, Ann Telnaes, and the rest of the US media (I can only imagine what sort of crap CNN and Fox News have been spouting the last few days): don’t you dare presume to teach France how to deal with terrorism. And don’t you dare use last Friday’s events to score cheap points against your own political establishment. 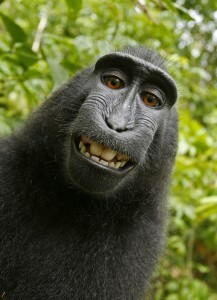 In case you hadn’t heard, animal rights organisation PETA and primatologist Antje Engelhardt, Ph.D., are suing photographer David Slater and self-publishing services provider Blurb, Inc., over photos of a crested macaque which Slater published in his book Wildlife Personalities. Motherboard has a pretty good series of articles on the subject. The core of PETA’s complaint is that the photos were not taken by Slater, but by the monkey, who inadvertently pressed the trigger while looking at her reflection in the lens of a camera which Slater had left unattended. Therefore, quoth PETA, the monkey holds the copyright to the photos, and all proceeds from the use of those photos should go to PETA, because of reasons. If you thought this was bizarre, it gets better: PETA and Engelhardt are not the nominal plaintiffs in the lawsuit. Instead, they claim to be merely representing Naruto, a male macaque living on the same preserve as the female macaque in the photo. In court documents, they consistently maintain that Naruto is the macaque in the photo; outside of that setting, they have repeatedly acknowledged, at least indirectly, that he is not. Having read both defendants’ motions to dismiss (the title of this post was shamelessly ripped from Slater’s motion), I am left to ponder the questions of PETA’s standing and of the monkey’s agency. Both defendants challenge the plaintiff’s standing on various grounds, including the fact that he is a monkey, but neither of them challenge PETA’s standing, which seems to me to violate the prohibition of third-party standing, unless PETA can show that they have power of attorney for the allegedly injured party (which is, apparently, a different monkey than the one on whose behalf they claim to be acting). I find that strange, but the case is ridiculous for so many other reasons that I doubt it matters, legally speaking. In this as in regard to inventions, originality is required. And while the word writings may be liberally construed, as it has been, to include original designs for engravings, prints, &c., it is only such as are original and are founded in the creative powers of the mind. Nor do they claim that she had any idea of what she was doing except looking at a shiny piece of glass at the end of a tube sticking out of a black box. If PETA prevails, this means that the mere act of triggering a camera set up by someone else, even without any understanding of the concept of a camera or ability to comprehend that an image was taken, grants the subject the copyright to the resulting image. How far will this principle extend? Will it extend to motion-triggered game cameras? Would PETA sue hunters on behalf of deer for the rights to the footage? Would they sue an ornithologist on behalf of crows that trigger cameras set up to study their behavior? Ah, who am I kidding, of course they would. Because PETA.